Prairie Stitches Is In The House!! This means Deb and I will begin sewing next week. Can't wait to cut it up and start piecing. I'll try to post pics of the blocks as they come together. Wanna know what we're making? 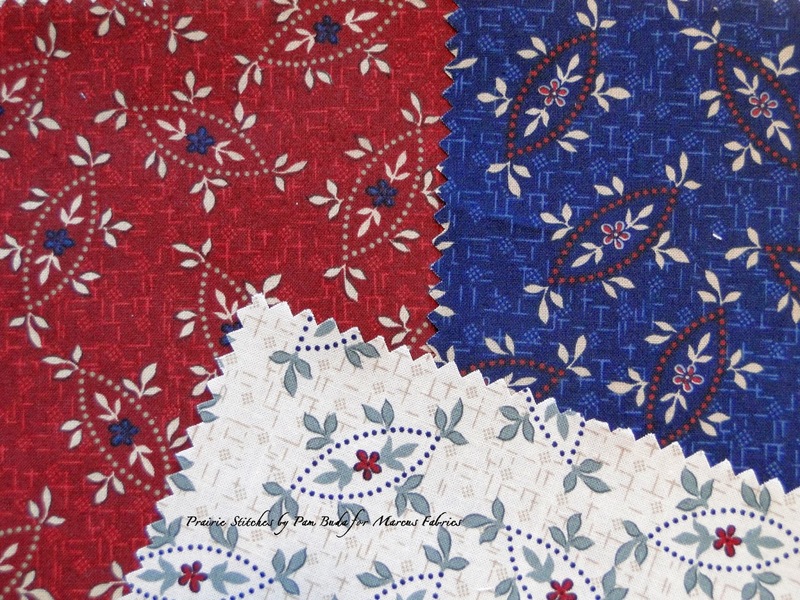 Click here to see the Electric Quilt image of my new pattern, Ada's Prairie Stitches. 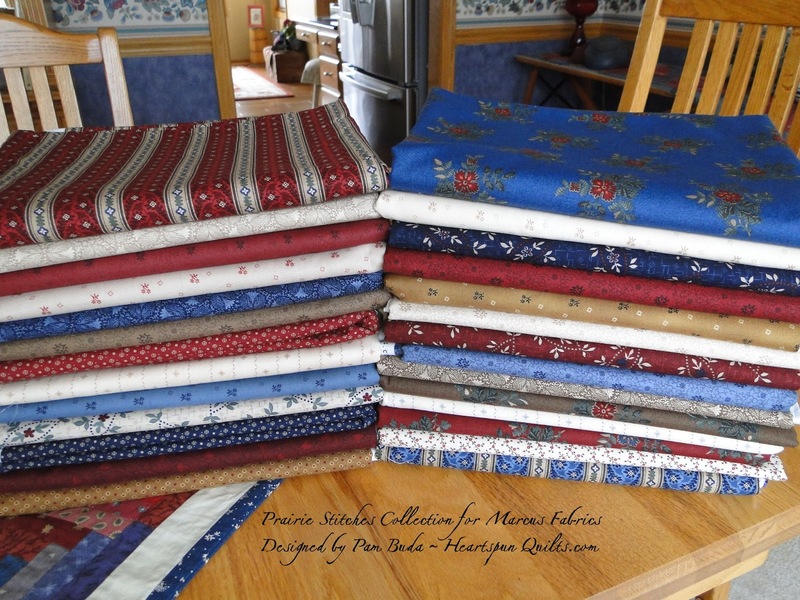 The Prairie Stitches collection will ship to your local quilt shop April 1st!! We're in for loads more snow starting tonight. I plan to be in my sewing room all day Sunday. Our Great Girlfriend Get~Away to St. Augustine! As you may know, I live in a suburb of Chicago, presently known as Chi-Artica. Today, the high temperature will be -9 degrees. A shock after coming home from a week in sunny, warm St. Augustine, FL!! The weather was wonderful. It was 70 degrees the first couple of days, and then dropped to the 50's. No complaints from the visitors to the city, although it was comical to see the Floridians shivering and wrapped in heavy coats with gloves and scarves. I guess it's all relative to what you're used to....we were walking about in our sweaters, loving every minute of it! At night, nearly every building in St. Augustine's historic district is illuminated in little twinkle lights (where I come from, they're known as Italian lights!). Tons and tons of them, causing Rachel Ray to comment that it's the "twinkliest city in America!" Charming to say the least. All the ladies attending our retreat agreed with Lynne and me that we enjoyed really good food and awesome Southern hospitality from everyone. This bee hive of activity is the reason we all came together....for three full days of sewing to our hearts content. Many girlfriends make the trip together to enjoy four projects over three days. There were several pairs of mothers and daughters, and even daughters-in-law, who took time from their busy lives to spend some quality time doing what they love. ....and some sewed into the wee hours of the night enjoying the hum of their sewing machine and the chatter among friends. There were several ladies who came alone.... without a girlfriend accompanying them, and we were delighted (and not at all surprised!) to see them making friends with all the others. In fact, it was very touching for Lynne and I to witness the exchange of emails and telephone numbers.....evidence that new friendships had formed. That is what is the best part of a Girlfriend Get-Away! Meeting wonderful women and making new friends. Lynne and I are blessed to have made over 40 new friendships over those 5 days together. We enjoyed the company of these lovely women, and had the pleasure of getting to know them better. The last morning was spent in lively conversation about possible destinations for future Great Girlfriend Get~Aways!! Our thanks to all the wonderful women who traveling to St. Augustine to enjoy a get-away and spend time doing what we all love.....quilting!! We had THE BEST TIME!!! If this sounds like fun to you, please consider joining us in September for our next Great Girlfriend Get~Away to Mackinaw City, Michigan. Click here to see the brochure with info about our destination and the four projects we'll be teaching. 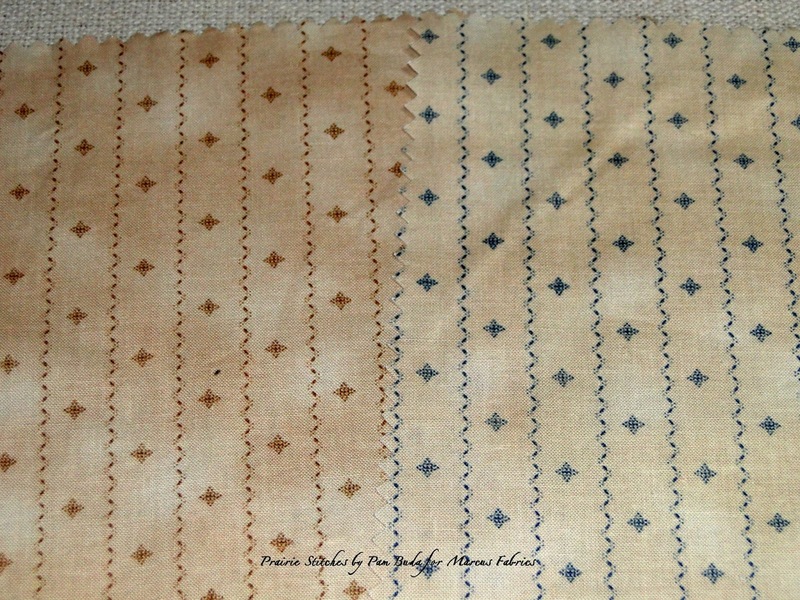 The reason the famous author was emailing me was because she said several of my fabrics were used by Di Ford in her mystery BOM, and she was writing to purchase a fabric she was missing. Well...plow me over with a feather! 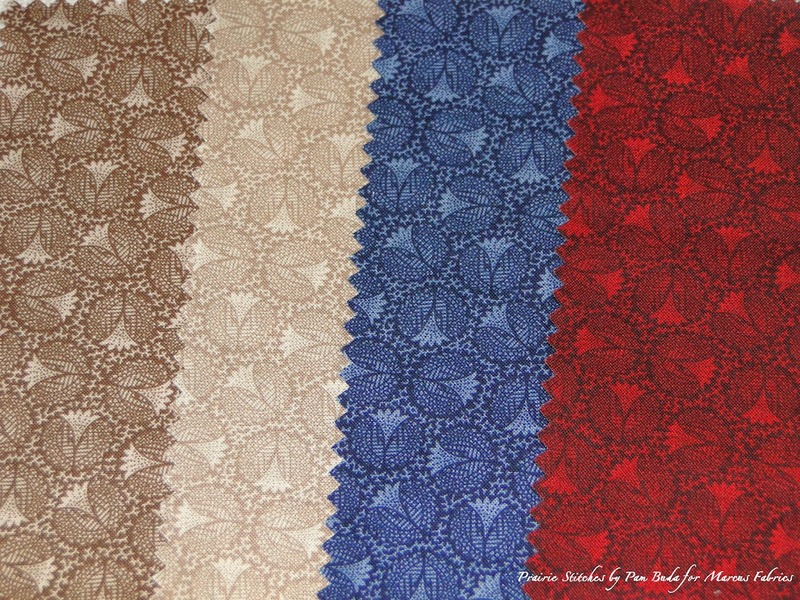 To say that I'm excited that Di Ford chose three of my fabrics for phase one of her BOM is a giant understatement. There are several other Marcus fabrics in the photo above as well. I talked with the folks at Marcus to see if they knew about this, and yes indeed they did. 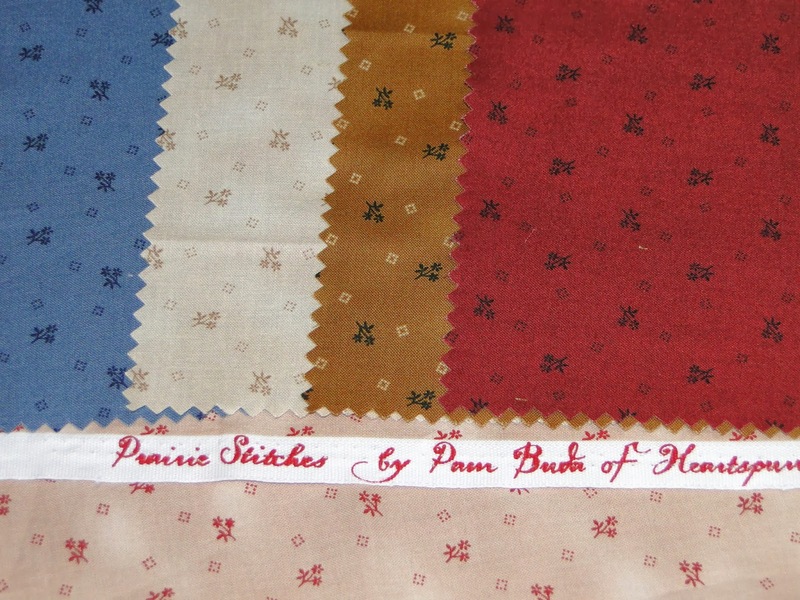 Apparently, I'll have several other Pin Money prints and Prairie wovens in the BOM!! WOW! I'm told there's a lot of Marcus Fabrics in the quilt. So, please forgive my humble ramblings, but this is all so new to me, and so jazzed!! Di...just in case you're out there....thank you!! And, dear famous author...thanks for letting me know, and it was so nice emailing back and forth with you!! Today, I have a little skip in my step.....teehee!!! 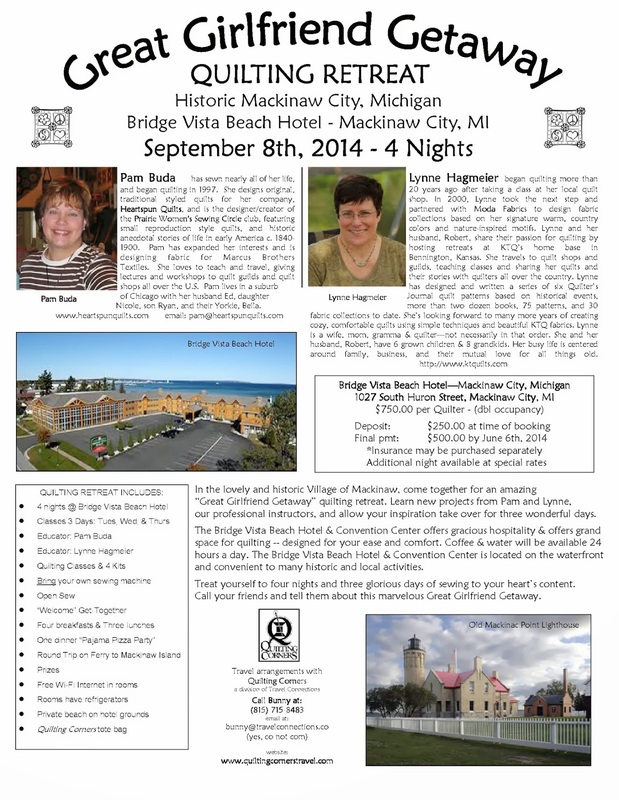 You're Invited to Mackinaw City, MI!!! At this very moment, Lynne Hagmeier (Kansas Troubles Quilters) and I are en route to spend 5 days with new-found Girlfriends in St. Augustine, FL for another Great Girlfriend Get-Away!! We're SO looking forward to this as it's always a fun event. Another opportunity to spend quality time with quilters!! In case you missed out on this event, you're in luck!! 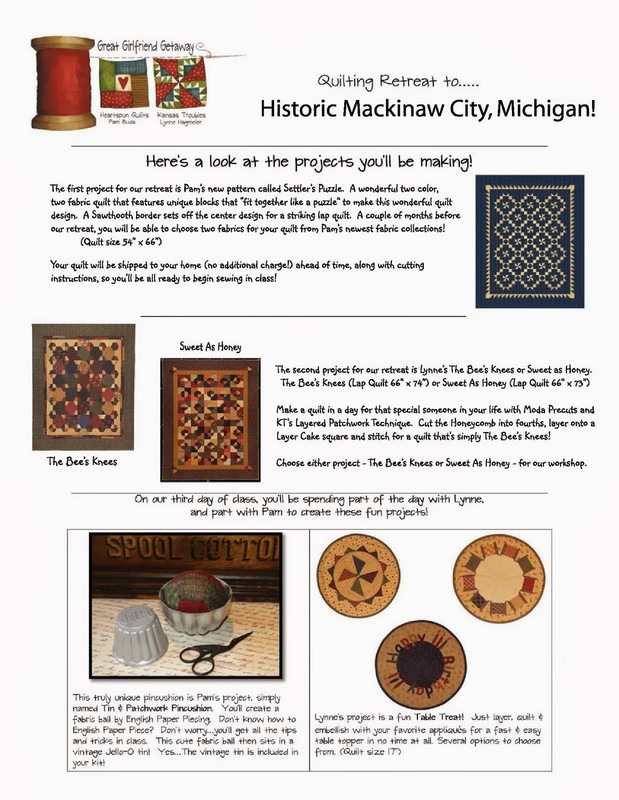 Here's all the particulars about our Mackinaw City event. Look at all the stuff included in the price!! Our travel planner, Bunny, did a great job of working her magic for the best price possible. The cost includes your room, four breakfasts, three lunches, and dinner pizza party, and a round trip ticket on the ferry to Mackinaw Island for the day! If you didn't know, Mackinaw Island is a charming island where they don't allow any motorized vehicles. It's full of charming restaurants and shops, not to mention the famous Grand Hotel! The price also includes all of your teaching fees, and FOUR KITS!! 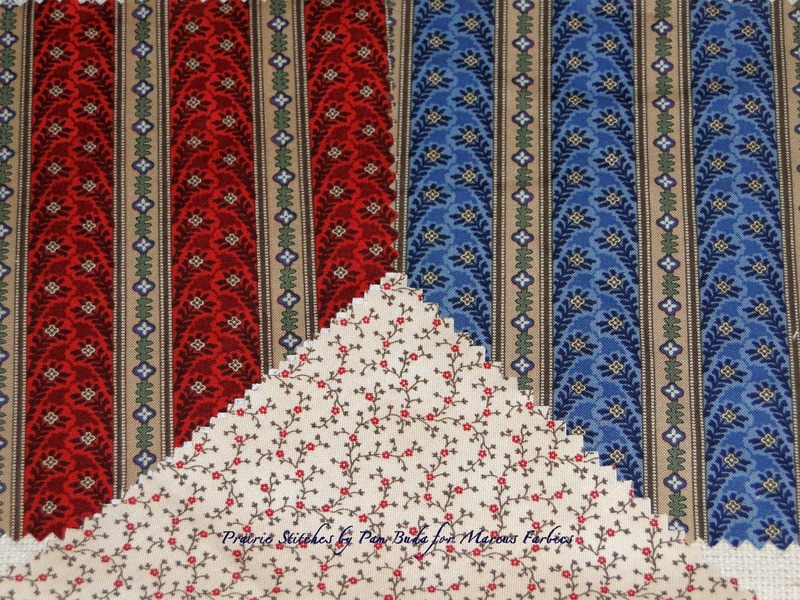 I've had many requests to once again offer my new quilt pattern, Settler's Puzzle, so that will be my full day class. Going along with that is my new Tin Pinkeep pincushion project for my half day class. 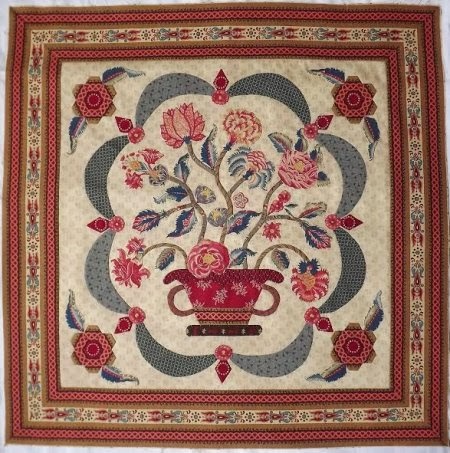 Lynne has two new quilts for you to choose from!! Chose the one you'd like to make, either The Bee's Knees or Sweet As Honey for her full day class! Choose one of her ever popular Table Treats for your half day class with Lynne. All terrific projects with loads of new skills to perfect. We're starting to take reservations now!! Add your name to our list right away. There has been a lot of interest in this particular retreat, so don't delay!! Click here to print our Great Girlfriend Get-Away brochure!! We're crossing our fingers and sure hoping to see you there!! After my afternoon spent in Pie Making 101, I had the pleasure of spending the next three days doing what I love....spending the day with quilters! I taught my new pattern, Settler's Puzzle, for two days, and my ever popular workshop, Practice What I Preach the other day. We had a great time together! The ladies at Village Dry Goods quilt shop really know how to throw a terrific party workshop! Each day, shop owners Fran & RoLayne surprised the workshop attendees with a little gift. One day it was this cute little crocheted doily that sits under your spool of thread. It twirls when you're sewing and is so sweet on this Featherweight, don't ya think? Another day, they made an adorable coffee mug caddy for everyone! How cute are they? See the little pincushion on the end of the clothes pin? There are little pockets inside of the coffee mug for more stuff. It's really easy to make, too! They were so nice and made all of them from an assortment of my fabrics. Look for them on the tables in the workshop photos. If you're interested in purchasing the pattern, give Village Dry Goods a call at 435-723-1315 (Pacific time). The pattern is $8.50 plus postage. One of the most interesting things about teaching in a classroom/workshop situation is that we all get to see different versions of the same quilt. Oh, how I love that!! Here are some photos of the variations of Settler's Puzzle. ...from the Practice What I Preach class. Several evenings, I got to mosey around the shop. JOY! Who doesn't love to shop, right? Fran and RoLayne purchased the building and moved the shop several months ago into this light and airy setting. I found it quite charming with lots of samples for inspiration. 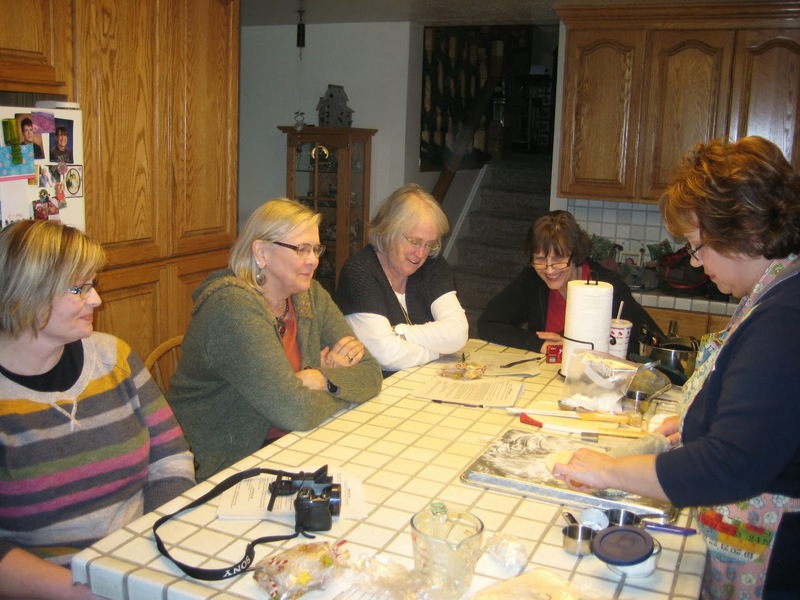 They have a large Prairie Women's Sewing Circle club at the shop. 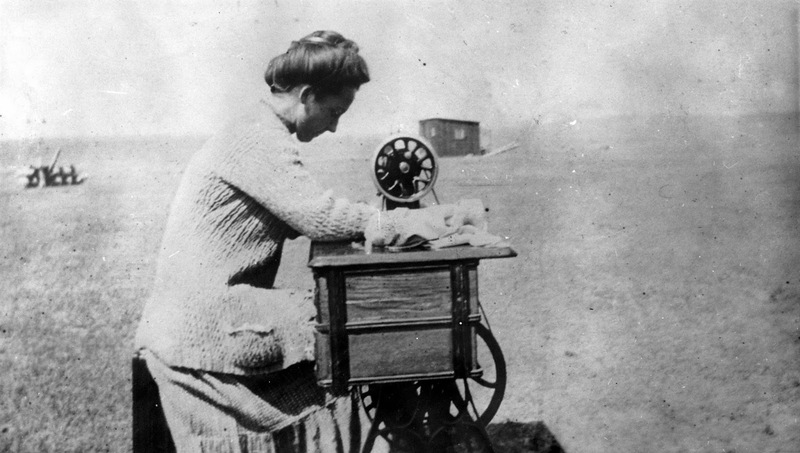 Lucky me, I was able to sit in on their regularly scheduled meeting on Thursday night, and meet their Prairie Women. Way fun!! As you can see, tons of good stuff! If you're anywhere in the area in your travels, don't miss a visit to Village Dry Goods! I promise, you won't be disappointed. My thanks to Fran, RoLayne, Janet O., the Village shop girls, and all the ladies I met at the Winter Retreat workshops. Every one of you made me feel so welcome! Back to the real world....off to run errands, grocery shop, run to the bank, yada, yada, yada. Last week, when I traveled to Brigham City, UT, to give several workshops and a lecture for the wonderful folks at Village Dry Goods quilt shop, several generous and wonderful quilters gave me an afternoon I'll never forget! A year in the making, that afternoon was spent learning to make pies! If you remember a few weeks ago when I posted my goals for the New Year, I told you about my 2013 goal to make delicious home-made soups, and to learn to make pies from scratch. When I posted those goals in January of 2013, I was touched and overwhelmed with many, many emails from my dear blog readers who shared their soup and pie recipes, as well as many good tips and tricks for making pie dough. Janet O was among them (pictured above on the left). 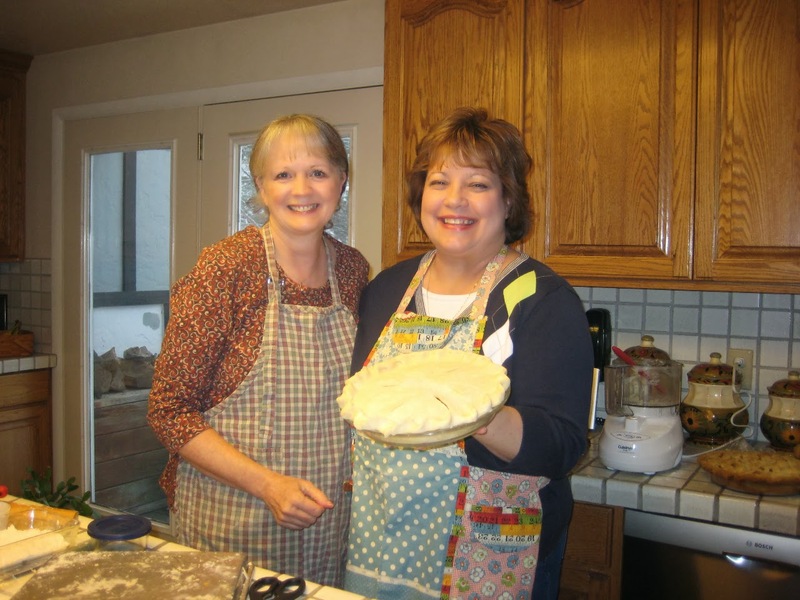 Janet and I became email pen pals through the year, and when Janet learned of my trip to her home state, we hatched a plan to get together so she could teach me to make pies!! This was no small undertaking as Janet lived some distance away, and we obviously needed a kitchen! 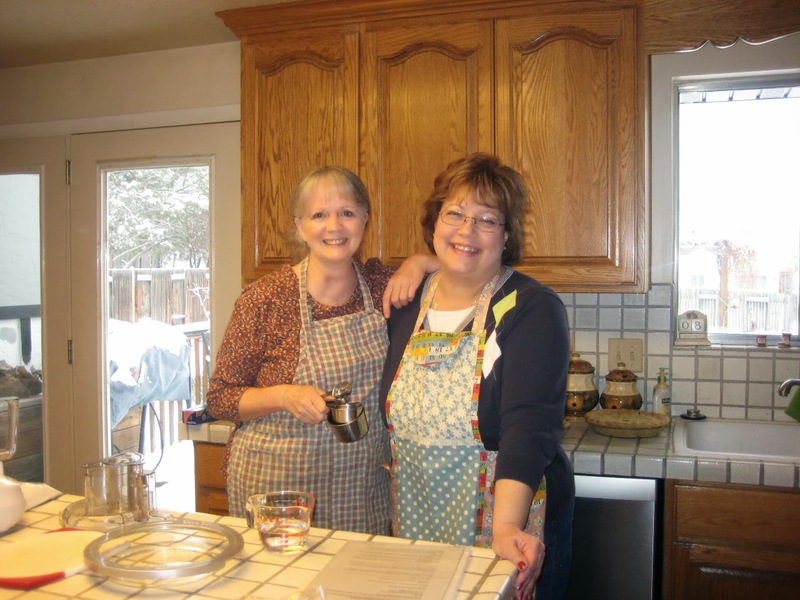 Shop owner, Fran, generously allowed us to use her kitchen, and Janet, along with the help of her pal, Kim, hauled several large bins of pie-making kitchen needfuls and ingredients down the snowy canyon for my lesson. What we won't do for a delicious pie! Under Janet's skillful instruction, I made my first successful, tasty pie crust from scratch, and mixed berry (one of my favorites!) filling for my pie. I'm still so excited!! Janet walked me thru every step, and shared tons of pie making knowledge with us. Honestly, she can have her own show on the Food Network, she was so professional!! All topped and ready to go into the oven!! Janet not only hauled half the equipment from her kitchen, and all the ingredients for my pie...but brought us two pies for us to eat! Heaven! The pie at the top of the photo is a pear pie with a lattice top crust. The bottom photo is the same mixed berry (Janet calls Razzleberry) pie I made. Aren't they beautiful?! 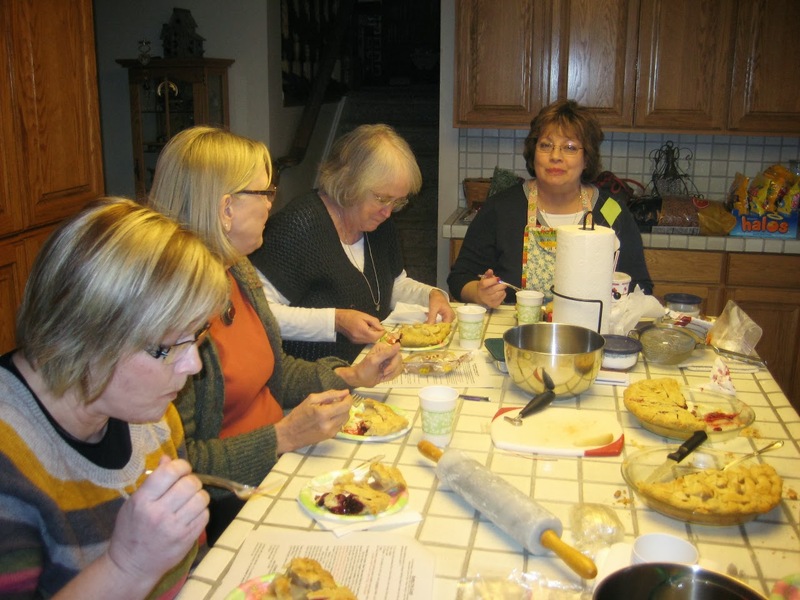 While my pie baked in the oven, we all enjoyed slices of Janet's pies. Absolutely delicious!! There just aren't words to properly express the generosity given to me by all of the comments & emails I've received by my blog readers. You're all the best and you make me smile every day!! Thank you so very much!! How do I begin to thank Janet for her encouragement, and for the fun, fun day I was able to spend with her making pie in Fran's kitchen? She put a ton of effort into making this happen, and I'll never forget it. My heartfelt thanks to you, Janet, for giving me these skills, not to mention wonderful memories. Special thanks to Fran, for allowing us to invade her kitchen for the afternoon, and to Kim, who drove down the snowy canyon so we could all meet! Each time I make a pie, I'll certainly be thinking of all of you!! I have no doubt....now, I'm going to be a pie making fool! Yum! I didn't travel to Village Dry Goods just to make pie! Look for all the fun stuff we did in my workshops in my next post!! Click here to enjoy Janet O's blog posts! 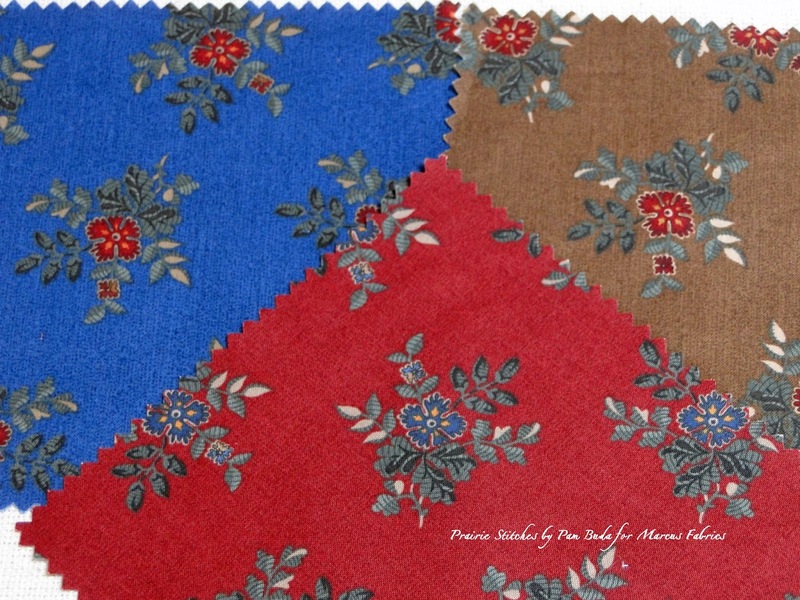 The fabrics in the collection are a mix of deep reds, blues, browns, golds and neutrals.....just some of my favorite colors. I think when these colors mix together in a quilt, it makes for a warm, traditional quilt with that vintage feel! This is the main print in the collection. (The colors are much, much brighter in the photo than they really are!!) I love a simple floral print as these were very simple folks. I imagine Ada might have chosen a print like this to make cheerful curtains or a dress. I'm madly in love with these two stripes!! Very old and vintage prints....it just says Civil War all over the place. Can you see lots of possibilities for some fun fussy cut Lucy Boston blocks? The sweet vine print is classic. (Whoa....what happened to that red?? It's very cranberry in person!) 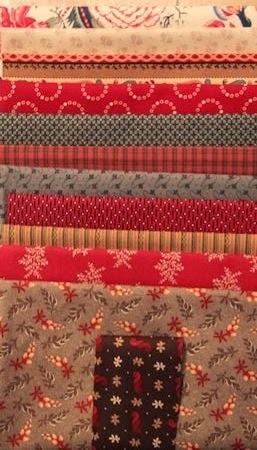 Every collection needs great coordinate prints, and aren't they the staples in our fabric stashes?? This is such a sweet little print. It turned out great in every color, so we just had to have them all! Madly, madly in love with all of these. Again...colors are wayyyy brighter (especially the red!) than in person. One good thing about my horrible photos are at least you can really see the print! The colors really are warm and vintage.....I promise! Believe it or not, this print came from another very old quilt. Just a great coordinate on a tiny scale. A good addition to the mix! Finally....a photo of the fabric that's most like the real thing. (Hhmmm...I wonder what camera settings were used to take this picture. I should do that all the time.) Depending on the project, I can be hot and cold about stripes. I really loved this little stripe, and it works very well in the quilt I designed using Prairie Stitches. Stripes give a different dimension to the motion within a quilt...sometimes a good thing....sometimes not. 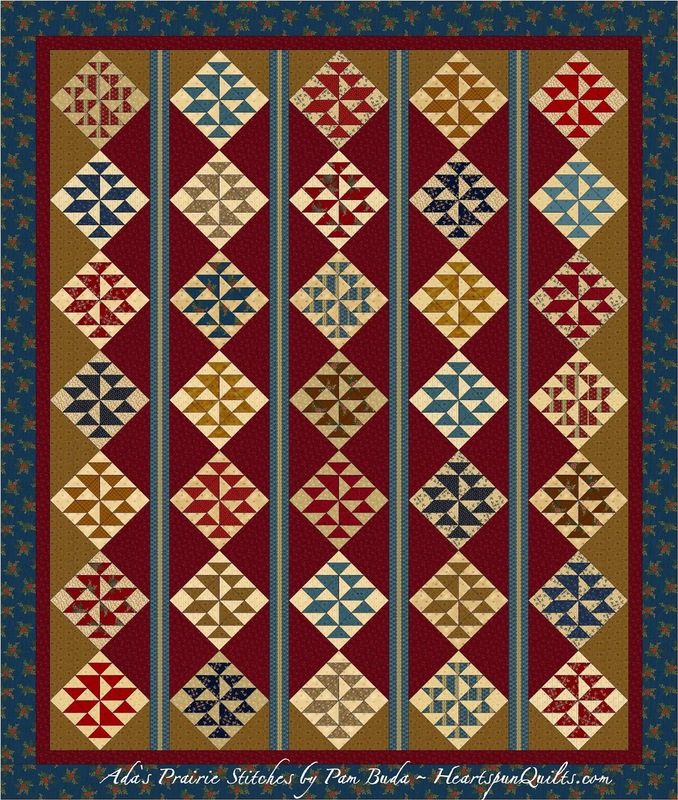 Speaking of the quilt I designed for the collection, here's my EQ concept design for my quilt named Ada's Prairie Stitches. 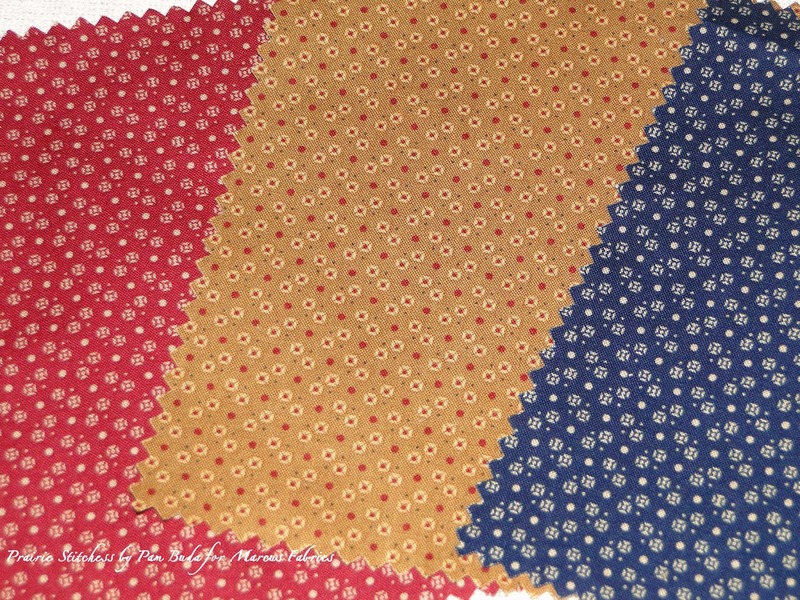 I'm just waiting for my sample fabric to arrive and we can begin sewing. So, so jazzed about this! Can't wait to see the awesome blue stripe as the setting bars, and start putting the blocks together, all set with that terrific red trumpet print. The blue floral print will do a great job of tying it all together. L*O*V*E!!! Click here to check out the entire collection (with much better color photos!) directly from the Marcus Fabrics website. 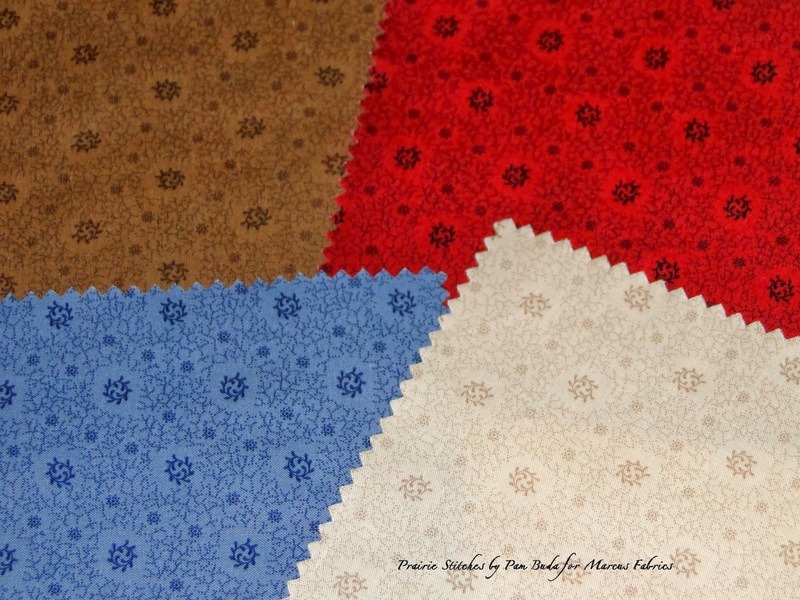 Prairie Stitches will be shipped to you local quilt shop in April, 2014!! I sure hope you like it as much as I do!